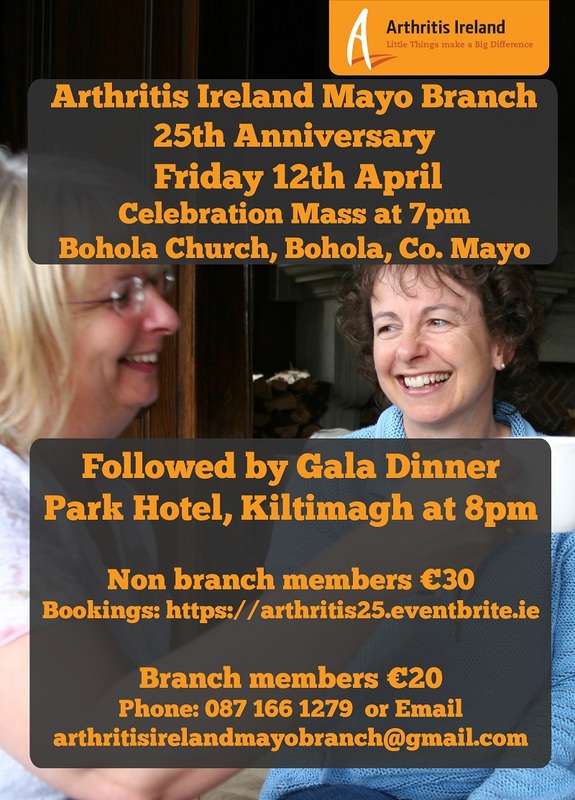 The Mayo branch of Arthritis Ireland will mark 25 years of providing local supports to people on 12 April. A Mass and gala dinner will be held to mark the quarter-century milestone. September 2018– Arthritis Research Talk -Ballina Co. Mayo with Dr. Emma Dorris Centre of Arthritis Research. 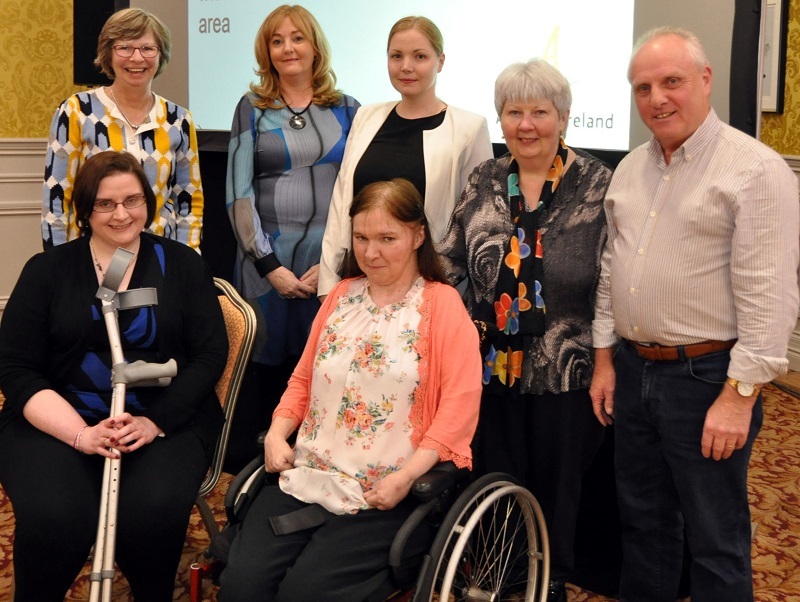 Back L-R Agnes Martin - Secretary, Majella Mulhaire – Committee Member, Dr. Emma Dorris – Centre for Arthritis Research UCD, Bridget Murtagh- Fundraising, Vincent Clarke – Committee Member, Front L-R: Stacey Grealis - Chairperson & Annmarie Healy - PRO. The Mass will take place in Bohola Church at 7pm on Friday 12 April, to be followed by a gala function in the Park Hotel, Kiltimagh at 8pm. The branch committee is inviting past and present branch members, healthcare professionals, as well as the general public to join them for the celebrations. Tickets can be booked online at http://arthritis25.eventbrite.ie. Queries about the events can also be made to arthritisirelandmayobranch@gmail.com or 087 166 1279. April 1994- First Public Meeting with over 500 people in attendance in the Travellers Friend Hotel, Castlebar. Pictured in the photo L-R, Mairead Costello- National Rehabilitation Board, John Deacy - Chairman, Mary Deacy, Dr. Bobby Coughlan- Consultant Rheumatologist Merlin Park Regional Hospital Galway, the late Mary Healy - PRO, Nora Monaghan - Secretary, the late Mary McHale and Rita Tolan – Treasurer. 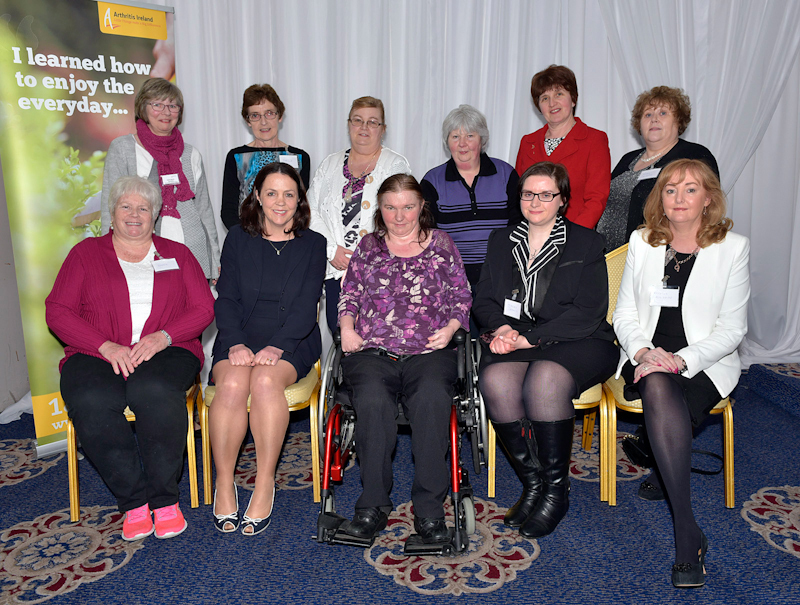 The Mayo branch of Arthritis Ireland is a voluntary group of people that live with arthritis and fibromyalgia. It was founded by the late Mrs Mary Healy from Bohola in 1994. There are more than 26,000 people living with arthritis in Mayo, ranging from new born babies through to the elderly. "After her passing, the branch committee continued to campaign and advocate for a rheumatology service at MUH. This was achieved in 2017, with the commencement of a rheumatology outpatient service. The committee today continues to advocate for better health services for people with musculoskeletal disease, to ensure access to early diagnosis, treatment and improved services in acute and primary care for the people of Mayo and across the Northwest." March 2017– Welcoming Dr. Carmel Silke, Consultant Rheumatologist to Service in MUH Back L-R Agnes Martin – Secretary, Sheila McNicholas Committee Member, Margaret Devaney – Walking Leader, Bridget Murtagh Fundraising, Teresa Gannon - Treasurer, Mary Murphy -Walking Leader. Front L-R Debbie Genoude – Committee member, Dr. Carmel Silke – Consultant Rheumatologist, Annmarie Healy - PRO, Stacey Grealis – Chairperson, Majella Mulhaire Committee member. The primary aim of the branch is to inform people through education, enable through self-management, and empower to take control of their disease and to be there to support people living with arthritis in the Mayo area. Ms Healy noted that over the 25 years' existence of the Mayo branch, an enormous debt of gratitude is due to large group of people. "The branch would like to acknowledge the staff of Mayo University Hospital, Merlin Park Hospital and Manorhamilton, as well as the GPs, primary care staff, nurses, physiotherapists, occupational therapists and podiatrists across the county who care tirelessly for people with arthritis, despite the challenges in the health service. "We also thank everyone who has fundraised on our behalf over the past 25 years. Your extraordinary generosity and selflessness has not only supported our work, it is helping people with this disease achieve the best possible quality of life. That is a fantastic legacy." Arthritis Ireland delivers its very successful self-management programmes in Mayo, Living Well with Arthritis and Breaking the Pain Cycle, as well as organising coping skills workshops, healthy eating and nutrition classes, physiotherapy-led exercise classes, walking groups, adapted seated exercises, water therapy and support groups. There are over 100 different types of arthritis and related conditions, such as osteoarthritis rheumatoid arthritis, psoriatic arthritis, ankylosing spondylitis, juvenile idiopathic arthritis, fibromyalgia and lupus. National Arthritis Week is 8-14th of April 2019.